This is the official "I have nothing worth writing about" vanity card. It will run whenever I have nothing worth writing about. Don't be surprised to see it quite a bit. From now on, when our schedule requires me to deliver a new card and I'm empty, I'll simply say, "Run one-eleven." A check of the one hundred and ten cards I've already written will quickly demonstrate that I should have written this card a long time ago. Why didn't I? Vanity. I had become vain about my vanity cards. I was determined to write a new one each week because, well... I'm just that kind of guy. But I'm older and wiser now. I know when I have nothing to say. And that knowledge is freedom. Freedom from the constant need to win your approval. 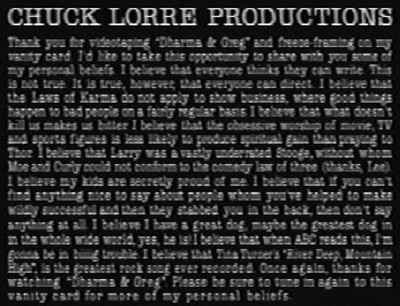 And more importantly, freedom from the obsessive and relentless need to end each vanity card on a joke. Governor Schwarzenegger.